Spectacular Sunsets from 9 room 4 bedroom 2 bath home with everything a waterfront home could ask for. 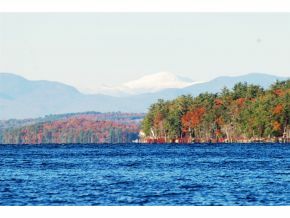 This is absolutely one of the best waterfront locations on Lake Winnipesaukee. The lot is level, beautifully landscaped, offers great privacy and faces directly west. The water and mountain views don't get any better. This beautiful vintage lake home was completely re-done for year round living in 1988. Renovations started with a poured concrete foundation which allowed for the addition of two more bedrooms, a bath, a family room, a laundry and utility room on the lower level. The main level was completely renovated from the kitchen, dining/living room, bedrooms, bath and sun room. Retaining the original "old lake" feel of the home was of primary importance to the owners. The favorite of the children will be the bunkhouse with its huge field-stone fireplace. 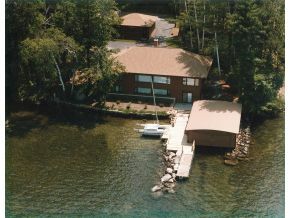 The property also includes a 24'x32' boathouse with an attached dock/sundeck all protected with a stone breakwater. Property includes add't interior lot across street. Listed by Roche Realty Group. Winnipesaukee for those not familiar with the lake is 42,000 acres. You can access fine restaurants from your boat and Gunstock Ski Area is less than 15 minutes away. In the winter you can hope on your snowmobile and head up to Meredith or Wolfeboro and the in the summer some of the best salmon fishing in New England.